Prepare for the Scare! What is Scareware? Malicious computer programs designed to trick a user into buying and downloading unnecessary and potentially dangerous software, such as fake antivirus protection. Once on your machine, scareware can overwhelm you with persistent notifications and fake alerts, which are difficult to close and can reappear quickly. The scareware software will badger you in hopes that you’ll relent and enter your credit card information to purchase the security product to clean the infections — viruses that don’t really exist. The most effective defense against scareware is a combination of best practices techniques. A good first step is to gather a little knowledge about scareware before it lands on your computer. Expect to get hit with it sooner or later and have a plan for how to react. Doing so can keep you from overreacting when that scary message pops up with a “Security Warning”, “Alert”, or “Update”. Sometimes it’s difficult not to overreact, especially when media hype and news headlines have heightened our awareness and anticipation of an impending malicious computer attack. When a scareware popup window appears, DO NOT click on it anywhere. If you panic or react instinctively, you might take hasty actions, like trying to click the “X” on the upper right-hand corner of the window in an attempt to close it. That’s what the scammers want you to do. Often, clicking the “X” not only fails to close the window, but it results in a duplicate windows appearing every time you click. Another possible outcome is called “clickjacking”, which launches your Internet browser and directs you to an unknown website, likely one featuring fake security scan. Finally, clicking the window could simply download rogue security software onto your machine, launching an executable file that could contain an actual virus or other malware. All are good reasons to not click anywhere on a scareware message. Hold down the “Ctrl” & “Alt” keys simultaneously while pressing the “Del” key. This will open the Task Manager window. From the top left tab (labeled “Applications”) click on the name of the scareware program to highlight it and then click “End Task” to shut it down. Hopefully you have an antivirus or Internet security software installed on your computer and it is turned on. (Don’t laugh! You’d be surprised how many people have it but unknowingly aren’t actually using it.) Make sure you know the name of the product you are using, as well as its look, feel, and functionality. That way, when your already-installed legitimate antivirus software notifies you of an infection or security threat, you’ll recognize it and know it’s authentic. Conversely, if a message comes from a program that’s not the one you recognize, you’ll know it’s most likely an imposter, aka scareware. Once you know your antivirus software, check to make sure it automatically updates with the latest security definitions on a regular basis. If it does, you can be reasonably certain that any popup messages you receive, saying you’re infected, are scare tactics by scareware scams. It never hurts to manually update your antivirus software to retrieve their latest virus definitions, followed by the running of a full system scan. Anytime a message from a supposed antivirus company claims that only their product can detect and remove a particular infection, run for the hills! That’s an indication of scareware. In that case, whatever you do, don’t cough up any cash. Adobe Reader: Used for reading PDF files. Java: Used for viewing certain websites and pages. Flash Player: Used for videos, ads, and games. To prevent scareware popup windows from tempting or tricking you, install an effective popup blocker program and set it to prevent popups from opening if they are from any websites other than ones you’ve approved. A popup blocker will stop most scareware attacks but some may still get through via other methods, such as Flash Player. Go directly to the website of the antivirus service provider to download computer security software. It’s risky to trust a link in a popup or email message, even if it appears to be from a trusted source. There are many convincing look-alikes that are bad news! Consider using an Internet browser other than Internet Explorer, such as Mozilla Firefox, Apple Safari, or Google Chrome. Do not open attachments or click on links or messages when using social networking sites, like Twitter or Facebook. If you do, be absolutely sure of where they came from and that they are safe. DO NOT automatically click, open, and/or download anything when prompted by a popup window or other message. 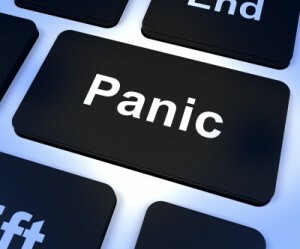 Under the best of circumstances, the term “scareware” can be used to describe any computer application that is used to prank users by causing anxiety or panic. Sometimes that is the only objective of the scareware, but more often than not, conning you out of your money and/or obtaining your personal information is the goal. According to some Internet security experts, scareware is actually on the decline. “Ransomware“, may be overtaking it as a threat. Whatever the case, scareware and ransomware both exhibit similar characteristics for infiltrating your machine. And both are bona fide threats to your safe computing. If you think you’ve been the victim of a scareware scam, you can file a complaint with the FBI’s Internet Crime Complaint Center. Should you be Afraid of Scareware? Filed Under: Blog Tagged With: fake anti-virus, fake antivirus, scareware, what is scareware?